Take a Test shows just the test and nothing else. Take a Test clears the clipboard. Students aren’t able to go to other websites. Students can’t open or access other apps. Students can’t change settings, extend their display, see notifications, get updates, or use autofill features. In this configuration, a user signs into in to the account and the Take a Test app automatically launches the pre-configured assessment URL in Microsoft Edge in a single-app, kiosk mode. A student will never have access to the desktop in this configuration. We recommend this configuration for high stakes testing. There are different methods to configure the assessment URL and a dedicated testing account depending on whether you're setting up Take a Test on a single PC or multiple PCs. You can use the Windows 10 Settings application. For more info, see Set up Take a Test on a single PC. For more info about these methods, see Set up Take a Test on multiple PCs. This allows teachers and test administrators an easier way to deploy assessments. We recommend this method for lower stakes assessments. You can enable this using a schema activation. To exit the Take a Test app at any time, press Ctrl+Alt+Delete. 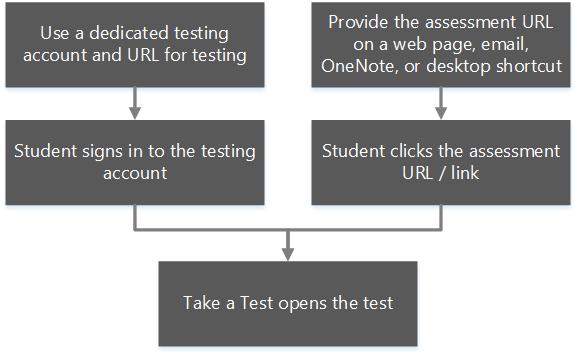 Teachers can use Microsoft Forms to create tests. See Create tests using Microsoft Forms to find out how. To learn more about the policies and settings set by the Take a Test app, see Take a Test app technical reference.